Site speed is an important SEO ranking factor. The argument is that fast sites provide a better user experience. This leads to higher engagement and repeat visits. But choosing the right hosting provider can be confusing and you can never be really sure that you’ve chosen the best solution unless you run multiple comparison tests. Take this example. 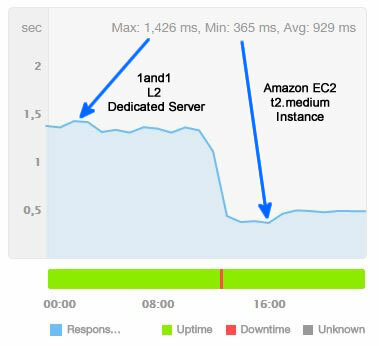 Our client had been happily using a 1and1 Dedicated L2 Server for the past 2-years when we convinced them to try a Amazon Web Services EC2 T2.Medium Hosting instance with a standard SSD drive. The improvement was significant. Before the change, the average server response time was around 1400 milliseconds. After the change, the average response time dropped to around 400 milliseconds. Testing was performed using a free account at pingdom.com. At first glance the EC2 instance is the obvious choice. However, setting up an EC2 instance is labour intensive. There isn’t a control panel and you need to be comfortable working via the command line over SSH. 1and1 L Class Dedicated Servers are reliable and provide much better performance than a shared hosting account or a typical virtual private server. They also come with a Plesk control panel which really speeds-up the process of setting-up new domains and databases. In conclusion, EC2 is lightening fast, but time-consuming and challenging to implement. 1and1 L Class Dedicated Servers aren’t the fastest but they are really easy to set-up and offer good reliable performance.